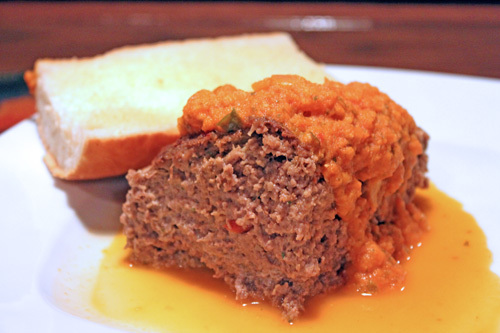 This is not your grandmother's meatloaf. We took one of our favorite old recipes and introduced a fusion of habanero peppers and other roasted peppers for a sweet and spicy flair. Add in as many habanero peppers as you can take. The habanero powder is for a bit of extra kick, but feel free to also include additional Cajun seasonings to your liking. Top with cheese and bake an extra few minutes for a variation. Thoroughly chop the roasted peppers and add to a large mixing bowl. Add all remaining ingredients and hand mix. Form into a loaf and bake 1 hour or until meat is cooked thoroughly through.